Arlene Theresa O’Leary passed peacefully from this earth on her 88th birthday – Saturday, December 31, 2016 due to complications from Lewey Body Dementia. Arlene was born in Claremont, NH on December 31, 1928. She was the daughter of the late Wilfred G. and Alice E. Picard. She was a resident of Merrimack, NH for the past 40 years. Prior to returning to NH, she lived in several places including Frankfurt, Germany, Palmer Park, Maryland and Falls Church, Virginia. She is survived by four children – Kevin O’Leary and his wife Mary of San Antonio, Texas; Maureen Carey and her husband Charles of Hudson, NH; Eileen O’Leary and her husband Bruce Kudeviz of Reston, VA; and Sean O’Leary and his wife Lori of Bradenton, FL. She had eight grandchildren – Erin, John, Megan, Ryan, Amanda, Connor, Logan and Kylie and one great grandchild, Olivia. She was predeceased in death by her husband John O’Leary, who was the founder of the John O’Leary Community Center in Merrimack. Many people will tell you that their parent was a one-of-a-kind mother or father. But Arlene was not only a one-of-a-kind mother, she was the best nurse, counselor, mediator, education advocate and tuna fish sandwich maker the world has known. She was also a firm believer that every outfit she wore should be purchased at Talbots, that clean windows and a clean house were right up there with attending mass every week and that you could never have enough Clorox bleach in your household. She passed on her pearls of wisdom to her family and provided gentle guidance as the O’Leary family matriarch. She graduated from Stephens High School in Claremont, NH and attended St. Luke’s Nursing School in Pittsfield, MA. She then went on to receive her Bachelor of Science in Nursing from St. Anslem’s College in Manchester, NH. She was the only one in her family and circle of friends to graduate and receive a four year college degree. 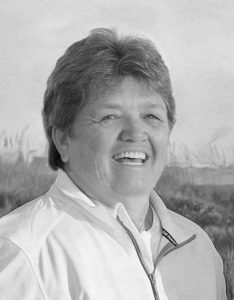 Her nursing career spanned over 45 years and it was her passion for helping others that made her the best at what she did. Some of her positions included Director of Nursing at Fairfax Hospital in Fairfax, Virginia; Nurse Manager at St. Joseph’s Hospital and Nurse Manager at the former Brookside Hospital in Nashua, NH, where she worked until her retirement. We say "retired" however, she continued to care tirelessly for family members and others who needed assistance often times having them reside with her and John so they could receive the care and compassion Arlene believed they deserved. Always putting others first – that was a value she lived by. 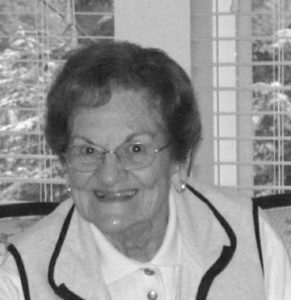 She was a devout Catholic and member of Our Lady of Mercy parish in Merrimack. She was also a member of the OLM Lady’s Guild, Reeds Ferry Women’s Club, Merrimack Senior Citizen’s Club and served on the Board of Directors for the John O’Leary Adult Community Center. She enjoyed gardening, cooking, tending to her orchids and watching James Bond movies, but her greatest passion was spending time with her family. Although we know she is in a better place, her compassionate and loving spirit, as well as her warmth and sensitivity, will be missed by all that knew her. She was an extraordinary person who personified the beauty of the simple human heart. The family would like to express their deepest appreciation to the staff and caregivers at Langdon Place in Nashua and Compassionate Care Hospice of Londonderry who provided Arlene with great care, dignity and love during the last nine months of her life. Each of you made an impact in Arlene’s and her family’s life. Calling hours will be held in the Rivet Funeral Home, 425 Daniel Webster Hwy, Merrimack, NH on Thursday Jan. 5, 2017 from 4-7 PM. A Mass of Christian Burial will be celebrated in Our Lady of Mercy Church, 16 Baboosic Lake Rd, Merrimack, NH on Friday at 9:30 AM. Burial will follow in Last Rest Cemetery, Merrimack, NH. Donations in Arlene’s memory may be made to the Lewey Body Dementia Association at lbda@lbda.org or, if you prefer, perform a random act of kindness to a stranger or person in need in Arlene’s honor. She would have been deeply touched. For more info or to sign an online Memorial Book go to www.rivetfuneralhome.com.